When it comes to working on your golf swing, there are usually two options: You either use an indoor simulator, where you hit a ball five yards into a projection screen and a computer provides swing analysis and ball tracking information; or you go to an outdoor range, where you can drive the ball as far as you can, but the only feedback on your success comes from what you can see with your eyes. What would happen, though, if you could combine the two? Each of the facility’s 60 semi-covered bays features a 32-inch SunBriteTV that provides swing analysis, ball-tracking information, social or solo games, and even simulations of 18 realworld golf courses. FlyingTee in Tulsa, OK does exactly that. The new golf entertainment facility, featuring three stories of golf bays, opened this June with a progressive take on the traditional driving range. More than 60 outdoor displays were integrated by Ford AV to complement the golf destination’s mission by delivering swing analysis, ball-tracking information, and even course simulations—hallmarks of the indoor golf sims—to every bay of this new take on a driving range. The 53,000-square-foot golf facility had been in development since 2013, when the owners approached Michael Burton, senior account manager at Ford AV, with their idea. The team at FlyingTee has created a highly accurate golf entertainment platform that allows a wide variety of golf games like “darts” to playing a full virtual round at one of many famous golf courses. Ford AV’s solution for delivering this information to each of the 60 semi-covered bays was 60 SunBriteTV 32-inch Pro Series outdoor screens functioning as heads-up displays. 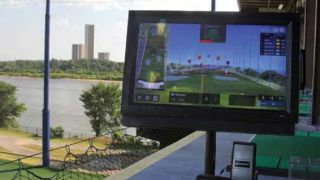 FlyingTee in Tulsa, OK combines the analytics of an indoor simulator with the freedom to drive a ball as far as you can. As part of FlyingTee’s high-tech offerings, guests have the ability to play four social or solo games and 18 different real-world golf course simulations. On the TV screens, flags are superimposed to represent each hole of famous courses like Pebble Beach and St. Andrews. For a break in between rounds, FlyingTee’s three floors allow three different atmospheres: Amateurs and experts alike mingle at the sports bar on the first floor, the second floor is a cozier choice designed for date nights and small groups, while the top level is made for large parties. Overall, the facility features 312 displays, including HD displays from Planar, NEC, and Samsung, a 200-inch video wall, a 12-foot-diameter sports ticker composed of 6mm pitch LEDs, and a 132-inch projection setup with a Canon HD projector. On the audio side, 17 Crown amplifiers for a total of more than 20,000 watts drive 156 JBL speakers and eight JBL subwoofers throughout the facility’s 19 audio zones. All media is controlled via a Crestron system from four iPads. But the standout technology at FlyingTee is inarguably the SunBriteTV units in the driving range bays, which are specified to stand up to anything the Oklahoma weather—which ranges from humid summers to wintry blizzards—can throw at it.